24 Port 1U Excel Category 5e Through Coupler Patch Panels offers RJ45 to RJ45 jack connectivity between the front and rear of the patch panel. 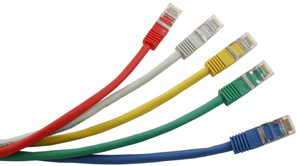 The patch panel is ideal for providing a cross connect for network equipment with the simple fitting of patch cords rather than switch link looms. Each panel has the port number screen printed below the port with an area to add the port identification above. The design lends itself for the easy application of a bespoke engraved label above and below the ports to suit the installation requirement. 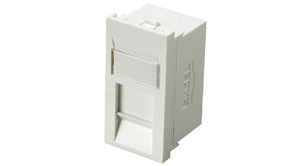 Excel Category 5e Data Outlets are manufactured and tested to the current Category 5 enhanced standards as defined by the TIA and ISO standards’ bodies. Swept frequency tests are applied to each critical performance characteristic, such as near end cross talk (NEXT) and far end cross talk (FEXT). Both Worst Case and Power Sum Test methods are applied. Actual performance exceeds the required standard by a considerable margin ensuring sufficient headroom for even the most demanding applications.